Doug and Sandi came down for the second time for an “extended stay” with Servant Ministries. Doug and Sandi have been a part of the Crossville Medical team, where they live, many times but these extended stays give a different opportunity and experience. They are also our “Directors of Communication” for our Embrace sponsors with Servant Ministries. They were a formal part of the February team that handed out school supplies and enjoyed that experience, for the second time. 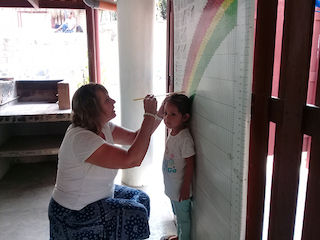 They are both retired teachers and love to see the children here be helped in the area of their education. That was the only team that was here during their visit but it gave them a true view, for the extra month, of what day-to-day life is like when there are no teams. They jumped in and helped in so many areas. They took the final inventory of how many supply packs/supplies were left over from this year’s distribution and put everything into good order in the storage area. 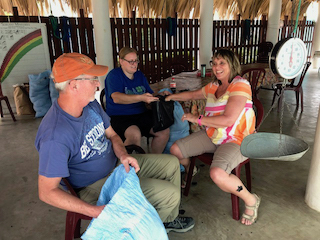 They had lots of opportunity to assist with different aspects of the Embrace program including the food bags and making some extra supplemental assistance up (Plumpy Nut) that we are giving to a few of our Embrace children. They assisted with two registration days for Embrace, which they had never seen and now understand better how we screen the families before accepting them into the program. 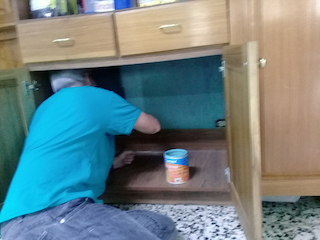 Doug helped our maintenance people in getting some painting projects done. They have already put a deposit down to stay two full months next year😊! 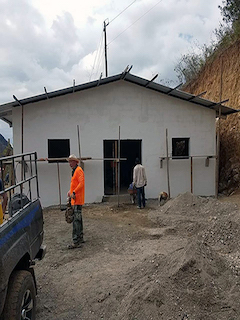 These extended stays are great for “taking the next step” in mission involvement. We have two areas available for longer term rental and I am thinking about the possibility of preparing other areas for longer term stays; as I have heard comments from a number of people about their desire to do something like this. 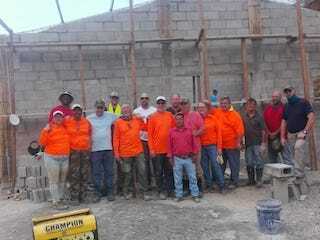 Fifteen people came from Georgia and Michigan; with their main focus to work on the church construction in the village of Tunuco. 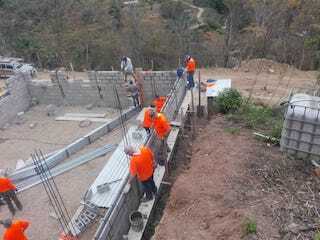 The Guatemalan workers had done the pre-construction work of having the foundation in prior to their arrival. 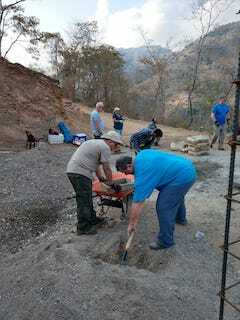 The team worked hard, in some very warm temperatures. 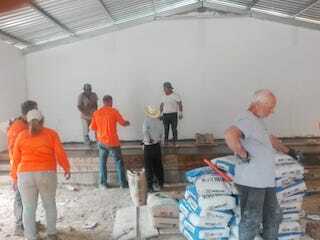 They got the walls raised up, the metal roof beams and tin roof completed, plastered the church inside and out and got the platform poured with concrete. 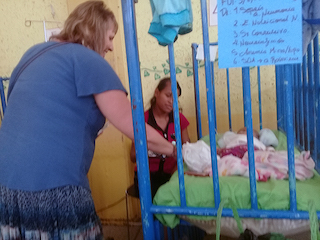 They had the opportunity to visit the local market and attend the Servant Ministries church in Camotan where one of the team preached. 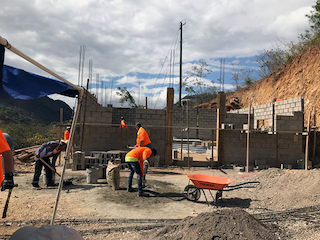 Three of the team members went to the Mayan Ruins in Copan and five of them participated with an Adopt-a-Child activity where they got to spend time with their Embrace children. 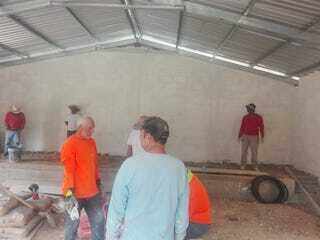 This team worked really hard and completed much of the building project on the church. 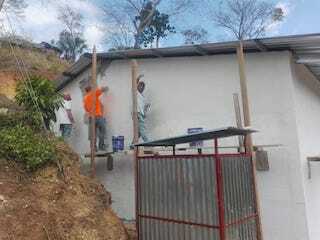 Our Guatemalan workers will finish what needs to be completed. 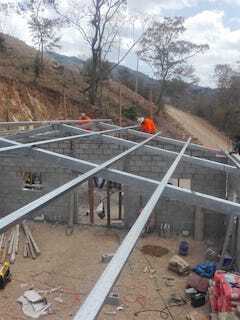 Have you been on a short term trip to Guatemala in the last year or so?????? Write us and tell us how it impacted your life and how you enjoyed it! We would like to start a new area that shares these “testimonies” with others in the hopes of motivating them to come on a team. You first timers can identify with the fact that you just “don’t know what you are getting into” and there are always a lot of questions. You can also share how it really turned out and what kind of an experience it was for you. I know that these short term trips can absolutely change people’s lives! Will you help us to encourage others to take the step to have this experience????? Send your testimony to nancy@servantministries.net and let others be blessed through your experience! Are you interested in bringing a team down in 2019 or 2020? The below chart shows the team(s) already scheduled and dates that are still available. If you are interested in bringing a team to fill one of the available time periods contact us. I have been communicating with a few more groups that haven't set their dates yet, but want to encourage you to get your time slot set aside. These short term trips can impact their participants in a dramatic way. Take advantage of exposing your people to an opportunity to "experience missions"!